This is a silaceous phytolith found on a tapelift from a school classroom in Eastern Washington State. This is an "elongate echinate verrucate epidermal long cell" phytolith by the ICPN method of description (Madella, et al, 2005). 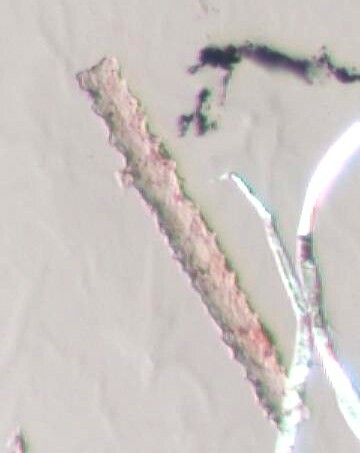 The two birefringent fibers on the right side of the photograph are paper fibers.